Popcorn Hour PopBox 3D review | What Hi-Fi? ‘PopBox’. That’s an exciting name for a dull-looking box, don’t you think? The stylised etching of the name is a nice touch, but otherwise this is rather plain, angular box that feels a bit cheap. 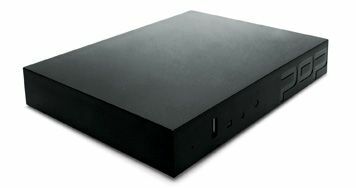 The thing is, it is cheap - £60 cheaper than the Boxee Box, in fact, and with a very similar raft of features. What that means is that with a couple of notable exceptions the Popcorn Hour PopBox 3D will play just about any digital media file out there. These can be fed to it from USB sticks or hard disks, or from your computer or dedicated NAS device, which it can access via the ethernet socket on the back or an optional, £18 wi-fi dongle. The ‘3D’ in the name indicates that the PopBox is capable of displaying 3D content. It won’t, however, display 3D Blu-ray files, instead relying on MKV3D and similar side-by-side and top-and-bottom 3D formats. We’re not convinced that there are many folk who will make use of that, but there’s no harm in it being available.Far more crucially, that the PopBox plays AVI and MKV video to a high standard. Standard-def is clean and balanced, while HD is sharp, with deep, insightful blacks and natural colours. It can be set to adapt its refresh rate to match the incoming signal, and if you do feed the unit a 1080p/24fps signal it’s not a million miles away from a dedicated Blu-ray player for motion. The sound has weight and dynamism, and is relatively musical for a box of this type (even if it won’t play Apple Lossless). The PopBox will even sniff out media files on your network and download artwork and synopses from IMDb. Apps include BBC iPlayer, YouTube, Facebook and Twitter. However, while iPlayer is a joy to use via the PopBox, social networking is a tricky task without a QWERTY remote such as the one you get with Boxee. Still, this is undeniably great value for a streamer with on-demand tendencies.